A Tim Hortons restaurant in Toronto is the 1st to install Order Assit in Canada. Read about it here. A deaf teen will play in the marching band at the University of Arkansas at Fayetteville this fall. KTHV-TV has this video report below. No captioning, but you can read part of the story here. A look at the retiring Florida School for the Deaf and the Blind President here. A Canadian medical student will complete her last final tomorrow: The Medical Council of Canada licensing exam. Read her story here. AT&T is asking a judge to dismiss a Justice Dept. lawsuit against it for allegedly failing to stop swindlers from taking millions out of a service meant to benefit the deaf. The suit claims the company knew Nigerian con men were stealing from the IP Relay service, but did nothing about it. Instead, it knowingly asked for reimbursement of international calls that are not eligible for the reimbursement program. AT&T says it didn't know the calls - as much as 95% of all the calls - were being fabricated and the lawsuit is an “improper and brazen attempt to use the False Claims Act to litigate a garden-variety regulatory claim.” The case started as a whistleblower lawsuit filed by Constance Lyttle, a former worker at an AT&T call center. The FCC reimburses companies like AT&T about $1.30 per minute out of a fund created by fees placed on consumer phone bills. Michael Hubbs is an Olympic short-track speed skate hopeful - even though he never laced up speed skates before coming to the Olympic Training Center in Salt Lake City just a couple of years ago. The 29-year-old was born deaf and completed as an inline skater as a teen. He switched to swimming at the Texas School for the Deaf, becoming a state champion and later setting records for Gallaudet University. Hubbs decided to return to inline competition after a decade away from the sport, winning some won medals before moving to Utah to pursue an Olympic dream on the ice. Read NPR's report on cochlear implants here. WIBC-FM in Indianapolis reports on a controversy over the use of ASL. Read the story here. Some members of the deaf community say a new music video is an insult. The video created by Mark Nakhla uses the Kanye West and Jay-Z song No Church in the Wild . Nakhla says he has studied ASL for a couple of years and utilized "American Sign Language shapes and sign language gestures." But the National Association of the Deaf says the video is "not an ASL interpretation in any sense, shape or form." Judge for yourself by watching the video posted below on DeafNewsToday.com. The University of Pennsylvania will start offering an ASL/Deaf Studies minor in the fall. Penn is the first school in the Ivy League to do so. The faculty of the School of Arts and Sciences unanimously approved the committee recommendation Tuesday. The minor will be a part of the Department of Linguistics. The first profoundly-deaf person to complete an Honours degree at the University of Adelaide in South Australia. Read the story here. Maryland School for the Deaf took top honors at Gallaudet's Academic Bowl for a third year in a row. More than 300 students from 80 schools took part, testing their knowledge of history and government, literature, science, geography, math, the arts, deaf studies, current events and popular culture. An artist in rural South Australia is profiled in a video report here on DeafNewsToday.com. A East Texas man is suing his former employer. Steven White says Broadway Home Center in Tyler violated ADA law by not accommodating his disability. White says he suffered hearing loss during his time working for the company as a salesman but he was not given a telephone that he could use and was insulted by his superior for his difficulty hearing. He eventually quit when he was criticized for failing to a complete a job because he couldn't fully understand the instructions. A former student is suing Portland State University for not allowing her service dog to stay with her because the building had carpeting. Cindy Leland says she was told she would have to live in another building without carpeting if she kept the dog. Leland says she was also harassed by someone regularly knocking at her door in the middle of the night. Her dog would alert her to the noise, but no one would be there when she got up to answer it. She says school officials refused to install a security camera to help her discover the culprit. Her suit claims other students with service dogs were threatened with eviction. She's asking for more than $1 million. Wyly Wade is suing Cochlear Limited in US court because the Australian company's implants failed his daughter. Cochlear recalled the Nucleus CI500 implant just one month after both of his daughter's implants quit working and had to be surgically removed, apparently because of a moisture problem in the device. Wade wants class action status for his complaint, which says the failure rate of the devices is 2.4%. The 5th World Congress of Mental Health and Deafness starts in Monterrey, Mexico one month from today - May 23-25. It is sponsored by the School of Psychology at the Autonomous University of Nuevo Leon. Topics will include bilingual education, sign language, language and communication. Read more here. A Florida boy went to put away his cochlear implant at a baseball field. That's when he was hit by a truck. Watch a video report below on DeafNewsToday.com or read the print story here. The Men's and Women's national deaf soccer teams will play exhibition games in Columbus, Ohio this coming Saturday (April 28). The Columbus Crew will play the Vancouver Whitecaps in the evening. For more information, click here. New York state educators made deaf students take a test on sounds and music. Read the story in the New York Post here. A champion for the deaf in the UK has died. Lord Jack Ashely of Stoke, was deaf himself. He died at the age of 89 after a short illness. Lord Ashely became a member of the British Parliament in 1966., losing his hearing the next year after an operation on his ears. But he remained a member of the governing body for 26 years. He established the All Party Disablement Group, which became the All Party Parliamentary Disability Group. He later founded the charity Defeating Deafness, now the Deafness Research UK). Gallaudet University gave him a Doctor of Humane Letters in 1975 for his efforts on behalf of deaf and hard-of-hearing persons. In 1987, he served as president of the RNID, which later became Action on Hearing Loss and in 1994 on the UK Council on Deafness. He lobbied for passage of the Disability Discrimination Act. In 1994, he received a cochlear implant. In retirement, he continued to work for improved captioning. An Oakland, New Jersey high school pitcher with a 90 mph fastball. Read the story here. The BBC reports on the first use of the "vibrant soundbridge" implant in Scotland in an article here. A Chinese firm that makes sunglasses is now offering a brand named after Hellen Keller. The motto of Xiamen Jinzhi is “You see the world, the world sees you.” A video ad for the product says "Wear these Helen Keller sunglasses as you descend from a chartered plane, and paparazzi and attractive people will flock to you." Helen Keller never wore sunglasses. Deaf swimmers will be allowed to use hand signals at the at the U.S. Olympic trials this summer. That's the decision from USA Swimming. It's a switch from the organization’s decision earlier this week, that said signals would not be allowed because international rules don't allow them. Swimmer Marcus Titus had asked his supporters to make their opinions known in support of deaf athletes. Titus is one of the country's top breaststrokers, posting the fastest time at last month's 100-meter breaststroke which beat four-time Olympic medalist Brendan Hansen. 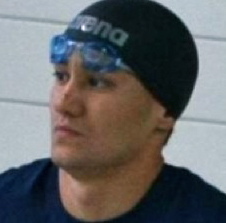 Deaf swimmer Terence Parkin of South Africa took the silver medal in the 200 breaststroke during the 2000 Olympics in Australia. A discrimination lawsuit will be filed soon for the way a deaf job applicant was treated by a Wendy's in Killeen, Texas (about 70 miles north of Austin). The man applied for a cooker position and had two years experience. During an interview with the Wendy's general manager, he was told “there is really no place for someone we cannot communicate with.” The EEOC is now working on behalf of the applicant. Perez Hilton weighs in on the sign language flubs by Johnny Depp and Natalie Portman. Read about it here. Finnish Deaf rapper Signmark returned to New York City this week where he performed to a packed house. He uses sign language and a vocal interpreter to spread awareness of deaf music and culture through hip-hop. There's a summary of what happened here and a video of the event posted below on DeafNewsToday.com. Deaf Rapper "Signmark" Performs at Gallatin - Captioned from Washington Square News on Vimeo. A federal court in DC has ruled that public schools do not have to help with the cost of cochlear implant maintenance. Two couples had sued the Education Department, claiming not to do so is a violation of Congressional requirements that children be offered "audiology services" by schools. The couples wanted schools to continue offering implant reprogramming. Many school have stopped providing this maintenance after federal educators decided it did not fall under federal requirements. The Dutch Electronic Art Festival takes place in Amsterdam starting Wednesday (May 16) and continues through Sunday (May 20). There's more information here. A deaf-blind athlete didn't let excessive heat stop him from completing the Boston Marathon. Bill Barkeley, who has Usher Syndrome, completed the run in 4 hours and 59 minutes despite temperatures near 90 degrees. More than 4000 people dropped out. Barkeley's team raised more than $300,000 for the Massachusetts Eye and Ear Infirmary. Even though it was the first marathon for the 50 year old, Barkeley has climbed major mountains - like Kiliminjaro and Mount Quandary. The Grand Rapids, Michigan resident even took a group of deaf teens through the Amazon in Peru with No Barriers, an organization helping people lead more full and active lives. The Sun reports on the controversy over signing in the new Paul McCartney video My Valentine here. The wife of a deaf pastor is giving $40,000 to start a fund to help deaf students receive training for missions and ministry. Daniel Johnson lead the deaf congregation at Forest Hills Baptist Church in Wilson, North Carolina until he lost a long battle with cancer last year at the age of 50. Now, his wife, Stephanie Johnson wants to provide for deaf seminary students with the Accessible Theological Education for the Deaf Fund. She hopes to help students with the cost of hiring interpreters because her husband struggled because he didn't having the funds to pay for an interpreter. He eventually was able to attend New Orleans Baptist Theological Seminary. When Daniel became deaf at the age of eight, his missionary parents left Chile and returned to the U.S.
Dentists are required to provide sign language interpreters for their Medicaid patients. Doctors in practices with fewer than 15 employees can get reimbursement for the interpreter's fee, though the physician is still responsible for arranging for the service. The FCC is fining T-Mobile $819,000 for not offering enough phones that are hearing aid compatible. Agency rules require wireless device makers to produce a certain number of handsets that can work with hearing aids, but T-Mobile fell short of the requirement in 2009 and during most of 2010. The FCC's goal is to make sure hearing aid users offer a decent number of phone choices. A mime festival is planned the coming Saturday (April 21) in Beverly, Massachusetts for both the deaf and hearing. Tony Toledo says he was inspired to put the event together after seeing his deaf wife enjoy the Oscar winning film The Artist. It takes place at the First Parish United Universalists Church. Paul McCartney's new music video features sign language from Natalie Portman and Johnny Depp. There is a version featuring Portman by herself, Depp by himself, and a third version combining both. My Valentine is from his most recent album Kisses on the Bottom. The idea for using sign in the video came from McCartney's fashion designer-daughter Stella. The combined video is posted below on DeafNewsToday.com. KTBC-TV in Austin reports on a deaf speed skater looking to make the US Olympic team. See the video below on DeafNewsToday.com. The daughter of former Giants quarterback Kurt Warner is helping to bring tonight's Signs & Rhymes: Intersections of Deaf & Hip-Hop Cultures. Jesse Warner, who is majoring in music therapy and sign language, worked with the NYU Gallatin school’s student council to bring Finnish hip-hop star SignMark and California comedian CJ Jones to the Big Apple, among others. More info here. The DeafNation Expo comes to Denver this Saturday (April 21) to the National Western Complex. There's more info here. Gallaudet President Hurwitz is now chairman of the North Eastern Athletic Conference Presidents’ Council. 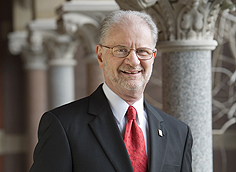 He'll serve for two years, taking over for Well College President Lisa Marsh Ryerson. Gallaudet was a charter member of the Capital Athletic Conference (CAC) but left for the conference during the 2010-11 season, joining a dozen other independent colleges. A trip to New York turned to tragedy this weekend when the parents of a deaf boy watched him run in front of a taxi cab yesterday afternoon. Five-year-old Timothy Keith is in Brooklyn hospital and may not live. He broke away from his parents, who are also deaf, and ran between two parked cars. The cab driver says he could not stop in time and was not charged. More than 8 out of 10 children who are or were hearing impaired now attend their local schools. Just a couple decades ago, 8 out of 10 hearing impaired children attended deaf schools. Deaf New Zealand political leader calls for DVD subtitles. Read the story here. Researchers in Iowa are working on a hybrid cochlear implant with an $11 million grant. The Iowa Cochlear Implant Clinical Research Center at the University of Iowa Hospitals and Clinics hopes its 20 physicians and researchers can create a shorter electrode with the money from the National Institutes of Health. Staff at the West Virginia School for the Deaf and Blind will have to speak deaf students through sign language. That's the new requirement at the Romney, West Virginia facility, according to Superintendent Lynn Boyer. The present employees, including teachers and bus drivers, will have 2 years to become fluent. New teachers will have to already have some signing skills and show advanced skills within two years. Deaf Finnish rap artist Signmark (Marko Vuoriheimo) will perform tonight (April 13) in Toronto at the Annex Wreckroom for The World Deaf Athletics Championships, which takes place this summer. For more info, click here. The infant child of a deaf woman drowned in Knoxville Tuesday. Jennifer Tomko left Javin Collins alone in bathtub and found the ten-month-old drowned when she returned. Her neighbors called 911 and attempted CPR, but her baby was pronounced dead at East Tennessee Children's Hospital. The FCC has issued new rules about how phones interact with hearing aids in the US. The rules take effect 30 days after publication in the Federal Register. Manufacturers and major service providers will have 2 years to put the technical standards into place while smaller providers will have 27 months to do so. Read more details here. The IRS explains in ASL what to do if you need more time to file your return. The ASL Club at Radford University will hold a talent show tonight (April 12) to show how the deaf community can enjoy music. The Western Virginia school's Deaf Jam Talent Show includes a dozen songs and performances by Radford's Department of Dance. There's more information here. A new generation of infrared laser-based cochlear implants will offer users better hearing than typical implants can do, according to Mark Bendett of Lockheed Martin Aculight. His company's laser-based technology stimulates inner ear cells with heat rather than electricity, which the current models do. Both models use the same batteries, microphones and signal processors. But currently used implants produce only up to eight frequencies. The laser implant can stimulate the cochlear nerves create dozens of separate sounds in different frequencies. Several research teams at US universities are working on similar technology. The New York Times takes a look at the career of Russell Harvard here. The Austin, Texas native grew up deaf and is now playing the role of Billy in the new off-Broadway play Tribes. Here is a profile of UCLA's Derrick Coleman here, as the deaf tailback makes a bid to enter the NFL. The state of Kentucky is planning to sell some property owned by its school for the deaf in Danville. Three pieces of land at the Kentucky School for the Deaf is up for bids. Two of them are about half of an acre of empty land while the third is close to a full acre and includes a two-story house, which is open for tours today at the 170-acre campus. There's a big increase in China's cochlear implant surgeries in the last couple of year. The Australian company Cochlear says, during the first 14 years it has operated in China, between 1995 and 2009, it only sold 4,000 devices. But since then, the company has sold 6,000. Authorities estimate there are some 5000 implant surgeries each year in China. The devices are supplied by Cochlear, Sonova, MED-EL and a small, Chinese company called Hangzhou Nurotron Biotechnology. Nurotron's cochlear sells its implants at about half the price of the other companies. DeafNation visits Atlanta this Saturday (April 14). More info here. The 10th Annual Maine Deaf Film Festival takes place this Thursday (April 12) through Saturday, (April 14) at the University of Southern Maine. There is more information here. NPR looks at the affect implants have had on deafness here. The DeafNation Expo comes to Atlanta this Saturday (April 14) at the Georgia International Convention Center in College Park. There's more info here. The Florida School for the Deaf and Blind now has the power of eminent domain. Florida governor Rick Scott signed a bill into law yesterday, granting the school the authority. State representative Bill Proctor of St. Augustine pushed the bill, saying it was unfair that the school was the only public education entity in the state, from high school districts to colleges, to not have the power. But some people living in St. Augustine didn't like the idea. They say the school will use the power to buy up property in historic neighborhoods. In order to quiet their concerns, the bill exempts anything in the city limits for a decade. Read an article about a Mississippi family asking for help to pay for a cochlear implant operation for their daughter here. A deaf woman in Japan has gotten a teaching license for English. Misato Fujiwara will begin teaching deaf students this coming week at Aichi Prefectural Nagoya School for the Aurally Disabled. 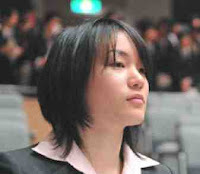 She was the first deaf student to graduate from Nagoya Gakuin University. The school had all the speeches and announcements during her graduation last month interpreted in sign language. The president of the school acknowledged Fujiwara in his speech saying, "what makes a difference in your life are courage and willingness to change." Deaf students make gestures like hearing children when trying to explain math concepts - and these gestures are different from the ideas they expressed in sign language. Researchers at the University of Chicago watched 40 deaf children explain math problems and noted they used gestures, as do hearing children, when explaining a math problem. Psychologist Susan Goldin-Meadow, who led the study, says previous research involving hearing children shows that gestures that do not match speech indicate there are teaching opportunities for the student. She believes the new research indicates the same is true for deaf children, in that gestures that are not ASL-based reveal a teachable moment. Goldin-Meadow says, “The gestures ASL signers use tell us when they are ready to learn math." If this is the case, it reveals a weakness in having a hearing teacher convey concepts to a deaf student through an interpreter. The interpreter may be looking at the student and miss the teachers gestures and not relay the information conveyed in those gestures. The deaf student is then only getting a part of the information, the part conveyed through spoken English. Funding for the study came from the National Institute for Child Health and Human Development and the National Science Foundation. Details are in the journal Cognition. A sorority will hold a walk to raise awareness for deaf and hard-of-hearing victims of domestic violence and sexual assault at the Rochester Institute of Technology. Heel Violence takes place at noon this coming Sunday (April 15) to benefit Advocacy Services for Abused Deaf Victims. Alpha Sigma Alpha is encouraging everyone to wear high heels while walking the mile. For more information, go here. The Kansas State student newspaper reviews a concert on campus last night by Beethoven’s Nightmare here. The Tennessee School for the Deaf's history lives through photographs. Read about it here. A trial is underway stemming from the crash of a plane during a Deaf Pilots Association event in Edgartown, Massachusetts. The three people on board the plane sued Cessna, accusing the aircraft manufacturer of faulty equipment. The Jeff Willoughby and his daughter, agreed to a settlement Friday. But the pilot, Alec Naiman, did not accept an offer from Cessna. The trial has been underway for three weeks and may go to the jury by the end of this week. The crash took place in 2005 at the Edgartown-Katama Airpark, leaving all three with serious injuries and Naiman a paraplegic. A look at what you can expect at the Maine Deaf Film Festival here. Watch the story from CNN on DeafNewsToday.com below (captions included) or click here for a link to the text version. A deaf man is suing a gas station owner for threatening him and his service dog. Christopher Cooley was a passenger in his sister's car when they stopped at the gas station in Columbus, Ohio. The owner, Demir Tahiraj, ordered him to leave the store. When Cooley tried to explain to the owner that "Sam" was a guide and not a pet, Cooley aledges Tahiraj screamed and threatened him. Instead of leaving, Cooley showed the service animal papers and proceeded to get coffee. When Tahiraj grabbed him by the collar, Cooley's sister intervened and police were called to the scene. A 5 year old deaf girl is dead after she was hit by an SUV in Cape Fair, Missouri, near the state border with Arkansas. Sahara Blevins was playing outside when she she ran down her driveway into the road below where a blindspot prevented her from seeing the 1997 Jeep Cherokee coming toward her. No charges have been filed against the teenage driver and a fund has been set up for the family to help pay for funeral costs for the girl. About 100 people turned out for a rally this weekend in support of a residence for the deaf and deaf/blind near Trenton, New Jersey. Valley View in Middletown Township could shut down because of state licensing problems. The facility is operating under a waiver from state licensing requirements right now.